Two long-serving Fylde ex-councillors have been made honorary aldermen. The prestigious honour, a strong tradition in Fylde, recognises long-serving councillors who made an outstanding contribution to the borough and their community during their time in office. Councillors agreed at their meeting on July 6 that the honour should go to Dawn Prestwich, who stepped down after 38 years as a councillor at the elections in May, and Howard Henshaw, who lost his St Leonard’s Ward seat after 20 years on the council. At a town hall ceremony on Monday, they were each presented with an Illuminated Record – a framed certificate featuring striking, brightly coloured calligraphy on parchment paper containing the minute from the council meeting referring to their nomination as aldermen. The Record is completed with the addition of Fylde Council’s gold common seal. Coun Hardy said: ‘These two individuals have been eminent servants of the borough for 58 years between them and I feel it is right to thank them on behalf of the council and the public. “Both have helped hundreds, if not thousands, of people in their years of public service. “Their accumulated wisdom is invaluable. Dawn Prestwich was mayor of Fylde in 1997-8 and mayoress to her late husband John 10 years later. 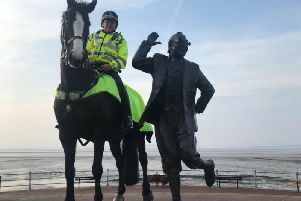 She said: “It was a pleasure to serve the people of Fylde and, as I said at the time I decided not to seek re-election, thanks to everyone for their support. “Being mayor and then mayoress to John were both great honours but I also recall the time when I was licensing committee chairman and bringing the new licensing rules into the area. He said: “This is a great honour. It was a satisfying and enjoyable 20 years on the council, with the mayoral year the highlight and I am delighted to be able to accompany Karen on various duties this year.